Hey everyone! It’s Jenn back from Deliciously Sprinkled with a delicious, no-bake pie recipe perfect for summer! 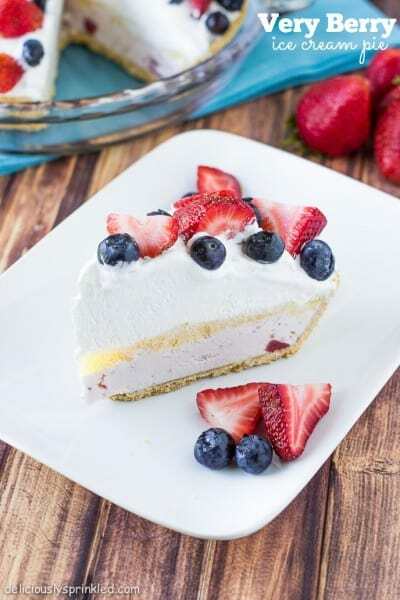 If you want, you can also add in some fresh blueberries as well, which makes a perfect red, white, and blue dessert for your Memorial Day or 4th of July BBQ’s. Enjoy & have a fun, safe Memorial Day weekend! Add strawberry pie filling to pie crust. Refrigerate for up to 6 hours or until firm. Top with cool whip and a slice strawberry. Do you think I could freeze this pie? The no bake is what drew me to this recipe. I’m not a strawberry fan so I bought some raspberry jello and fresh raspberries, my daughter is already swooning over this. Thanks for sharing, happy Memorial Day weekend to you! Do you know anyway to fix this? I had the same issue, Shelby. My pie is refrigerating now. Hopefully it will set up. You can use any kind of hard cookies if you don’t have graham crackers where you live. Cool whip is an unhealthy store bought version of whipped cream. I made this for Easter dessert & it was delicious! I baked my crust & then let it cool in the fridge while making the filling. I notice some of the comments said their pie was soup & never set up. Once you add your hot water to the gelatin & dissolve, then add your cold water & ice cubes, let it sit for a few minutes to thicken slightly before you add the cool whip otherwise it won’t set up. Thanks for the great recipe, I would make it again! It is in a tub and it is frozen dessert topping. Cool whip is an unhealthy store bought version of whipped cream. 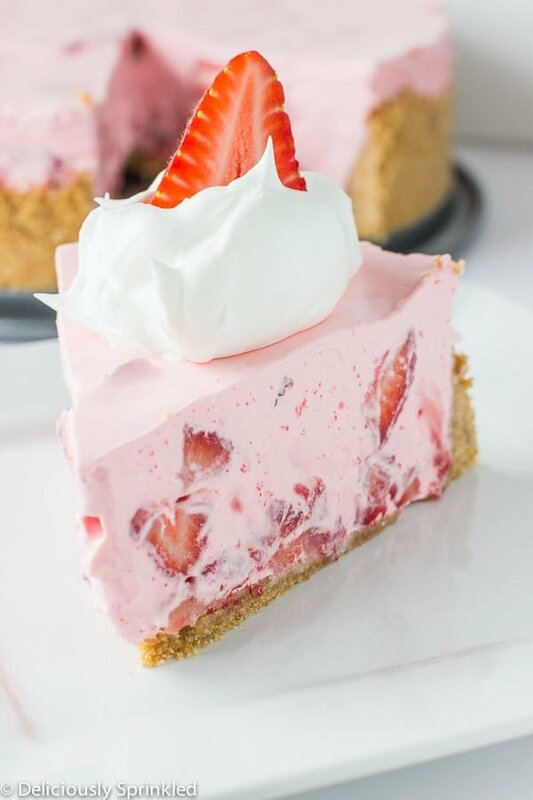 I make this without any water… Add your jello powder directly to the cool whip and then stir in sliced strawberries and put in crust. Only needs about an hour in the fridge to set. Works with any matching/complementary jello and fresh fruit. Peach is awesome too! thank you for this (although you may never see my reply)! I was hoping to make this for dessert tonight but don’t have much time to let it set. this helps a ton! this is not as an exciting recipe as I thought when I saw it. 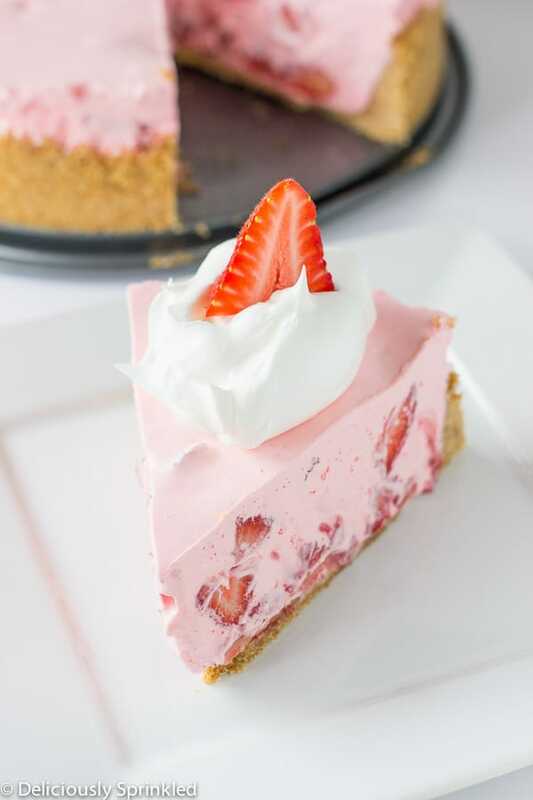 I would make the crust,skip the cinnamon, cream room temp cream cheese with powdered sugar, put that on top of crust, (that will protect the crust from the jello mix) then let jello set for awhile, its ok if it starts to thicken, just add the whip cream and strawberries and there ya go. much better,!!! 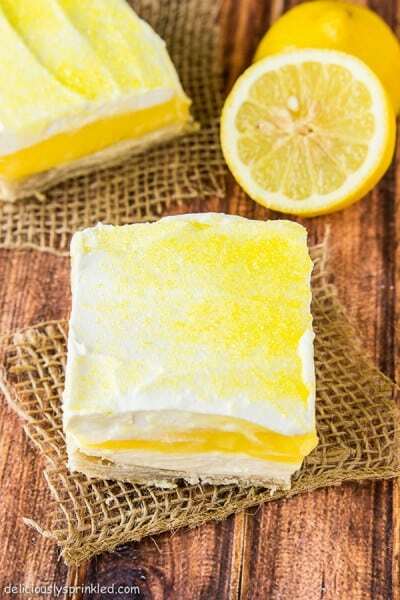 Lovely, quick and easy dessert. I used 8oz thickened cream and whipped it till soft peaks. Used Oreo biscuits and added a little icing sugar in filling. It was awesome. I dont have cool whip, can i make whipped cream instead? Will that work?? This may be a dumb question, but I’m not a master in the kitchen. The instructions say refrigerate “up to 6 hours.” I was planning on making the pie tonight for a dinner party tomorrow. Is it okay to refrigerate more than 6 hours? I let my gelatin sit before adding the cool whip and it’s still soup. Plus I have enough filling for 2 pies!?! I hope it sets tonight. Could you please tell me how much Gelatin to use?